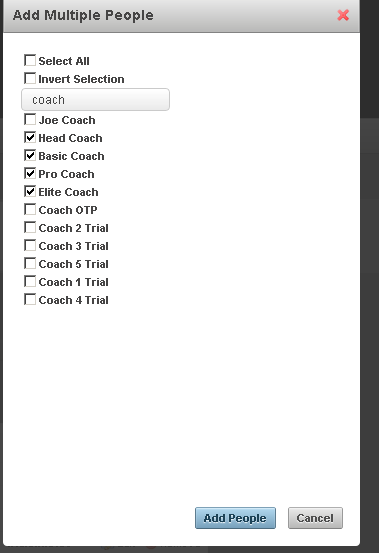 "Add Multiple" allows you to add multiple users, permissions or system permissions at once. 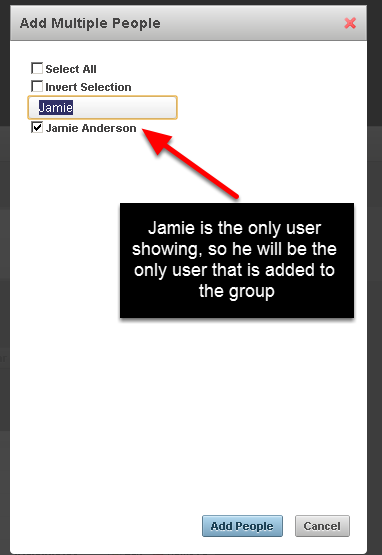 However, if you use the Add Multiple button when you add in Multiple Users, and you perform multiple searches in the text box, ONLY the users that are ticked AND visible at the time you click "Add People" will be added. There is a way around this, but you need to read the documentation here. 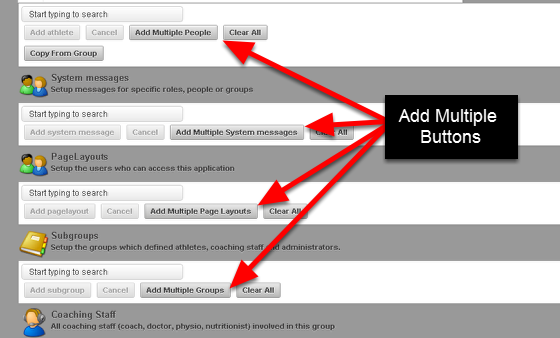 To add multiple users to a group, you can click "Add Multiple Users". 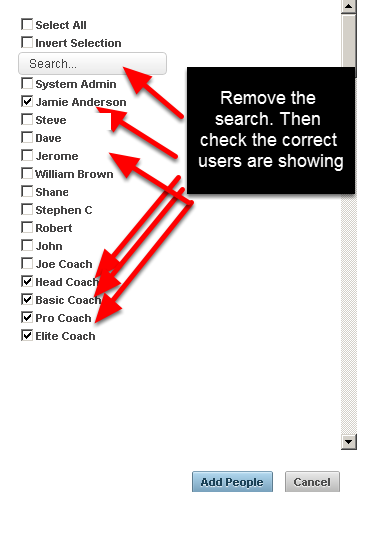 If you ticked the coaches that you wanted to add, AND then you typed in a new search parameter (like "Jamie", as shown below), the Coach names would be hidden from view. 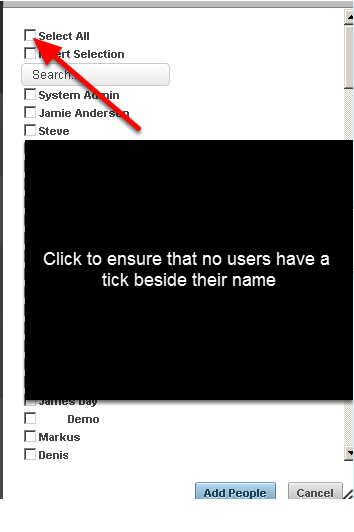 Only users that you can SEE in the list are added when you click the "Add People" button. 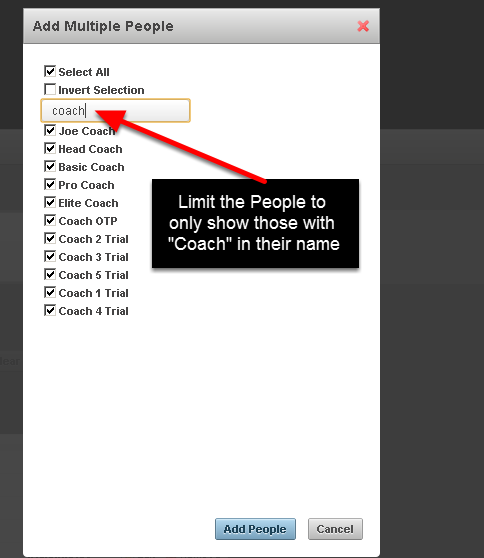 It was designed this way as some users forgot to tick the "select all" to deselect all of the users, they added in a search parameter and click on Add People, and then hundreds of athletes/users were added to a group because they were still selected in the background. The example here shows that when you remove the search parameter, all of the users appear and you can see which users are ticked. N.B. if you didn't deselect all of the user initially when the user list first appeared then you will have a lot of users that are still ticked! !